I'll be posting photos in the next day or so of some new sword baldrics. 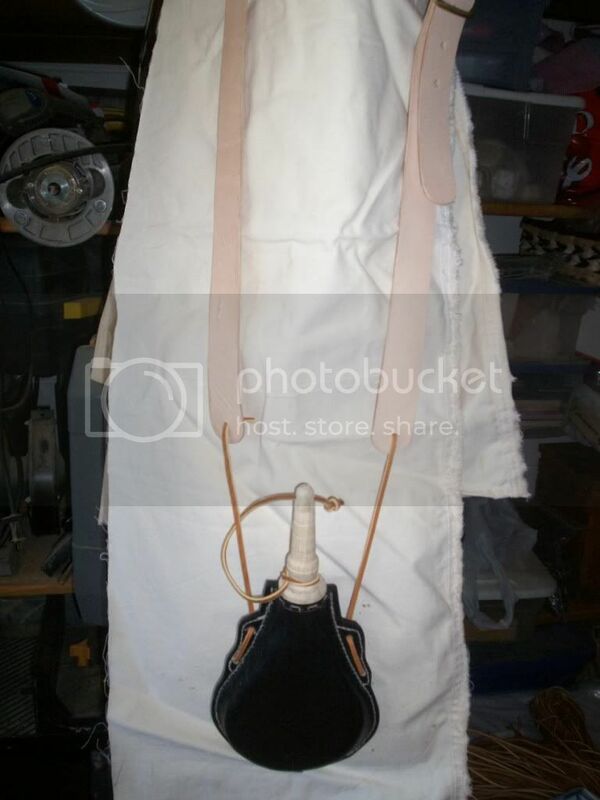 Also have made some skirt hangers for the ladies to keep their hems outta the mud, or just look more fetching. who are you. do we know you? hey mate, glad to see you back amongst us. how you doing? Yeah, who is that guy, Dutch??? He wears funny socks from the pic in the avatar. What's up, Sutler? Dutch & Animal, yes I'm still among the living. Docs seem to think I'm gonna be around a while longer, will know better later this week, newest test results will be in, then will have a better idea of the real "score". Even though I've been in illness and recovery mode I been doin' my best to keep busy. 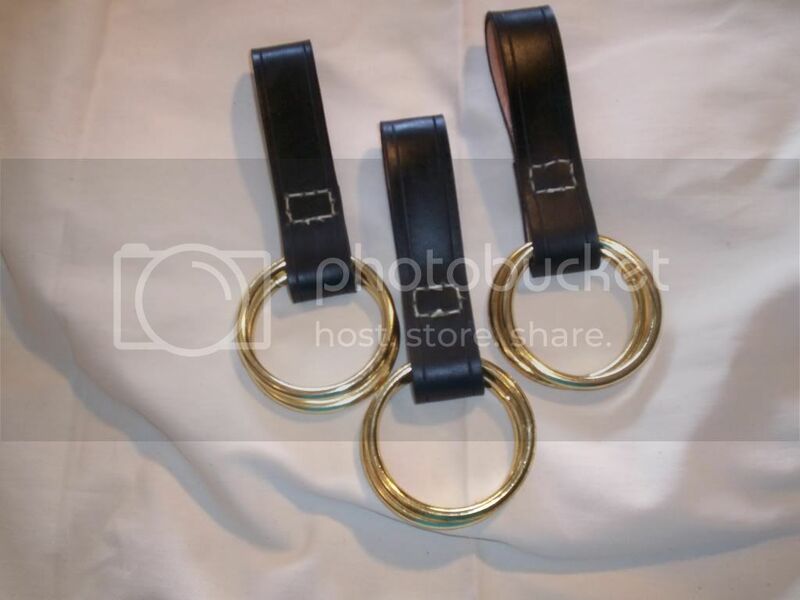 These baldrics are based on an English infantry design, they can be built adjustable or not, I recently found a place to get some authentic buckles and will be getting some soon. 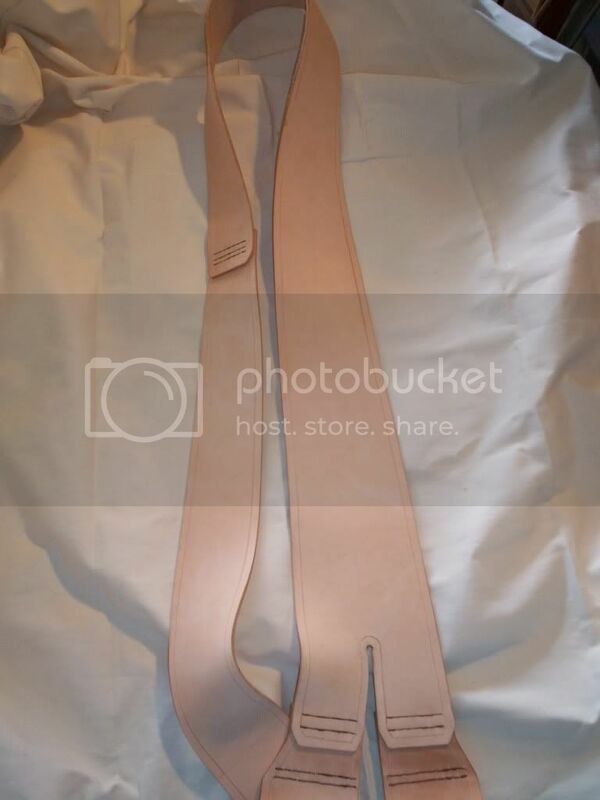 Baldrics are $75.00 fixed size and $85.00 with buckles. Of course you can still see some other new stuff on a couple of my posts .... "I'm still here" and ..."been keeping busy" I believe. Maybe I'll go bump them. These are good for cell phones and cigs and other small stuff they are about 1/2 the size of a cartridge box and are $30.00 plain and $38.00 with 2 colors and/or the design. 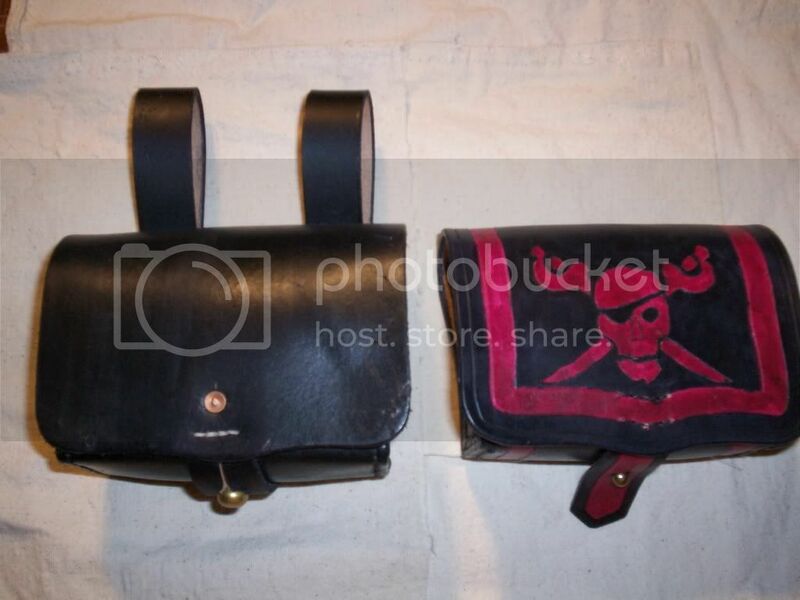 I built the black and red one for my grandson so it also is a good size for a small pirate's cartridge box. This is what a set looks like now. This is what they looked like then. Thanks to all who've given me the chance to practice and make them better. I will be posting some new photos of an improved Whydah box in the next few days .... a change has come to light that I'm incorporating into newer editions. Around the 1st of the year I plan to debut an authentic Buccaneer's cartouche box ..... just need to get a spare minute to build them. 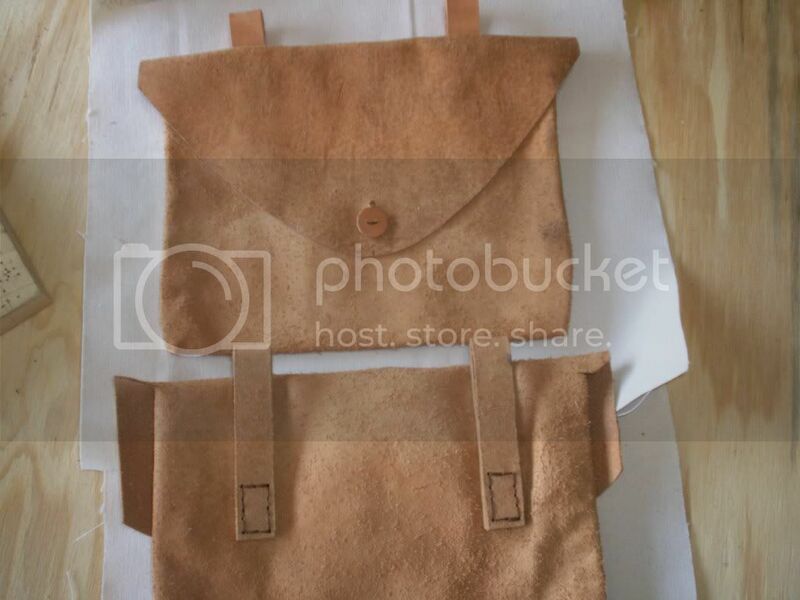 I've also gotten my "tarring" recipe together for haversacks and/or shoulder bags. Will also post pics of a new belt wallet. I've been busy in the shop all year and just haven't been on the Pub as much as I used to. Very cool - can't wait to see the new photos. Hey, just received the green onion bottle from you - very cool! Thanks. Have ye gotten to me 4' folding plank yet??? A client sent me some pics from a NatGeo Article that allowed me to finally see that the box has end flaps to help,keep weather out and that explains the stitching on the edges of the top flap. As a result of this new info, all boxes from here on will have the end flaps. These are some belt wallets that I made a while ago and just got 'round to shooting. 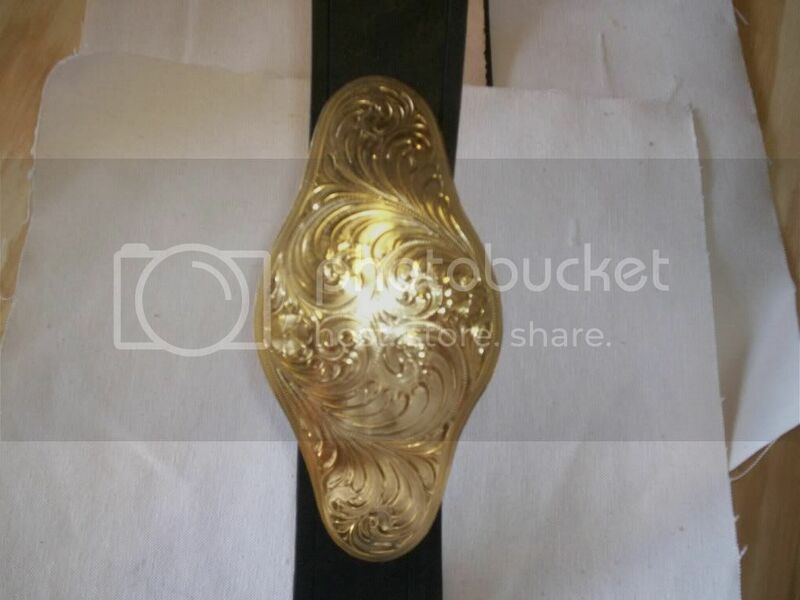 This is a one off baldric ..... only one of this buckle that I have. 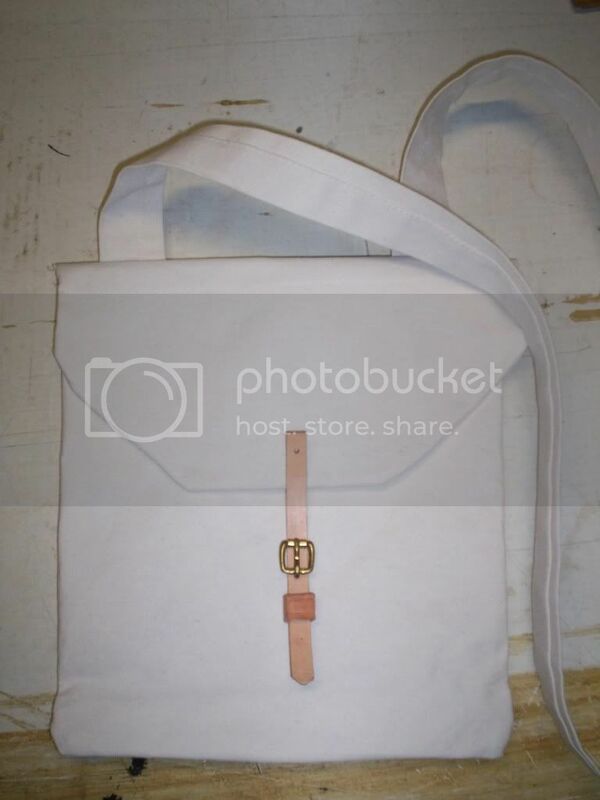 I'm also doing some "tarred" and plain canvas haversacks, I can make these without the buckle and strap closure. Drop me a PM or an e-mail to inquire. 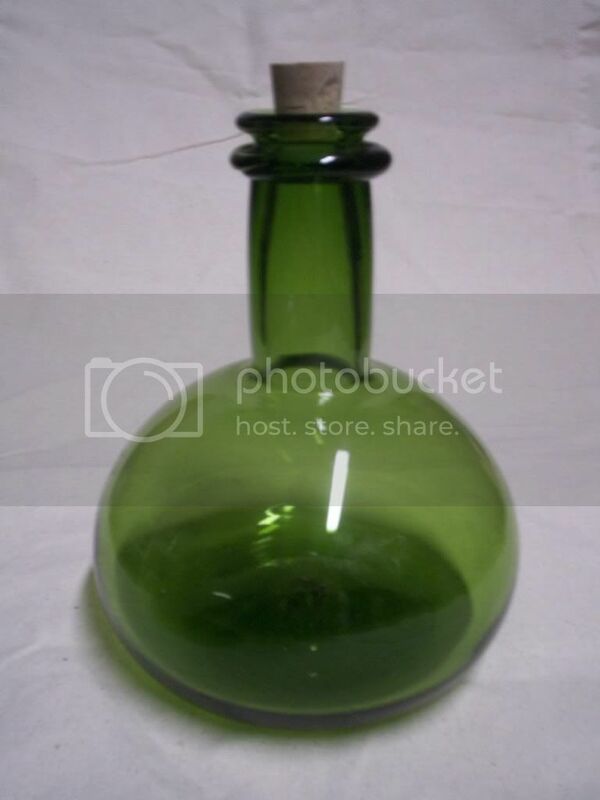 I also picked a couple of onion bottles like the large one on the website as well as 2 large hand blown green glass bottles with handles. Pictures to follow .... eventually. To return to subject of Cartouche boxes I will be constructing some Phipps boxes which seem to be the one with the stitched in liner and some boxes based on Labat's description. Expect those next year. Some photos of more new sh....tuff. 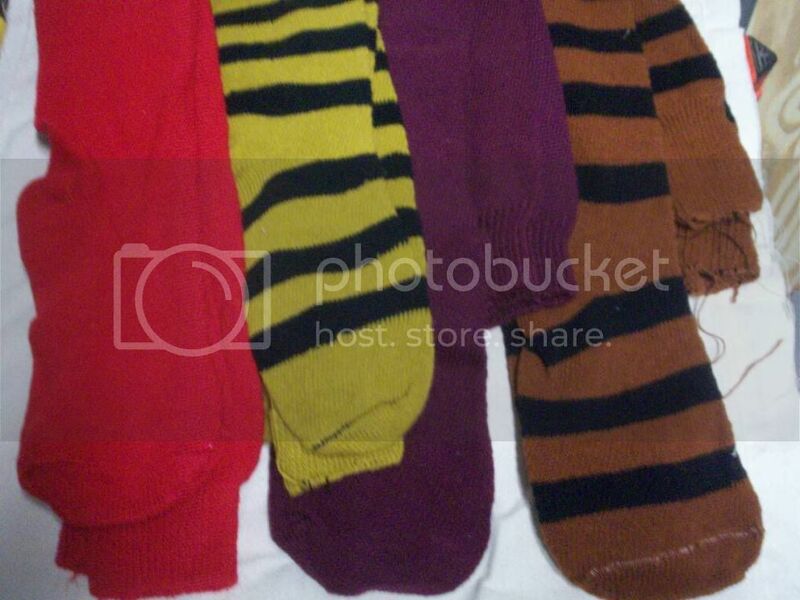 These socks are not just knee high .... oh no ... they're THIGH high! 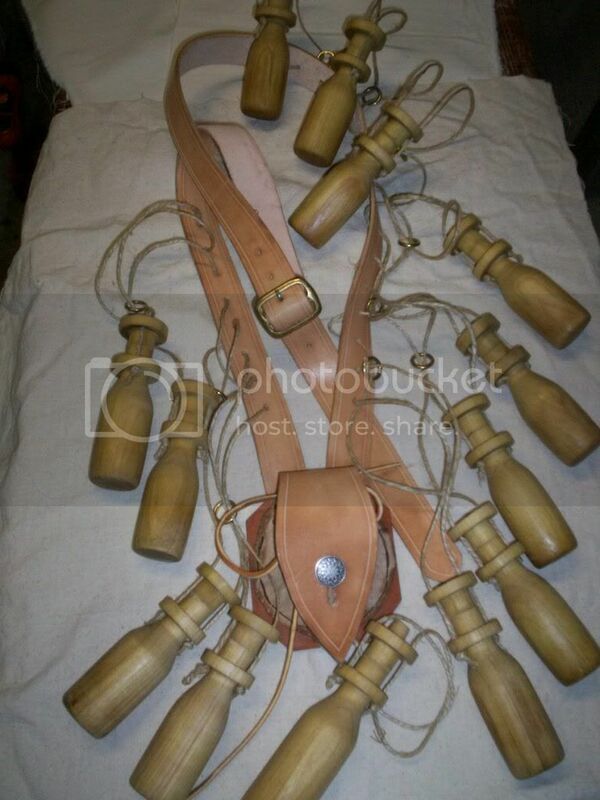 The onion bottles are each about 7-1/2" tall and, of course, I can make a leather belt sling for 'em. I have 2 of theses unique pitchers, they are are about 10-1/2" tall and probably weigh about 2 lbs. They are hefty. Love that lower glass bottle! It looks rather 'suggestive'. The folding table was received yesterday, great job. Thanks for all your help in working this puppy's transportation out. You are most welcome, thanks for the kudos and your patience! As alluded to, several months ago, I have been working on some new sh ...tuff. This is the 1st of several new pieces that I'll be offering soon. Soon as I get 'em finished. 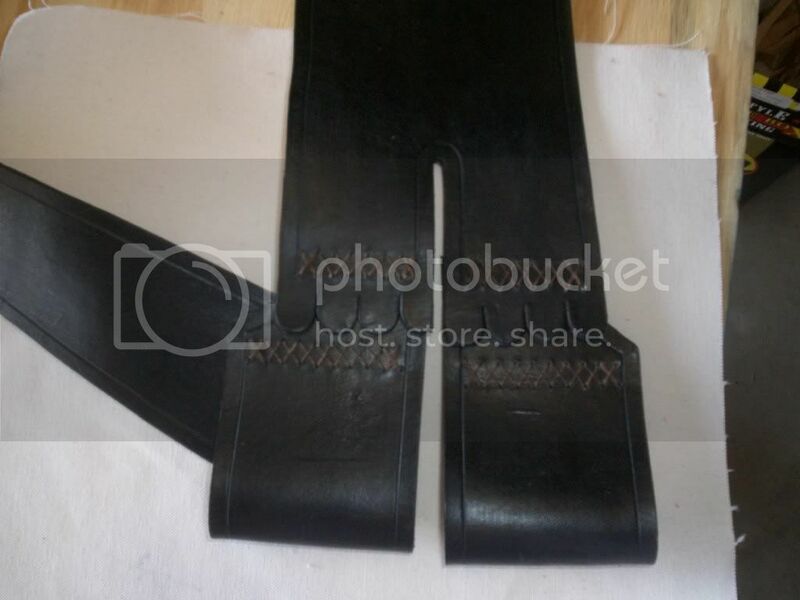 This is a Sword Belt, the loops for your scabbard can be made to accommodate your sword's width. 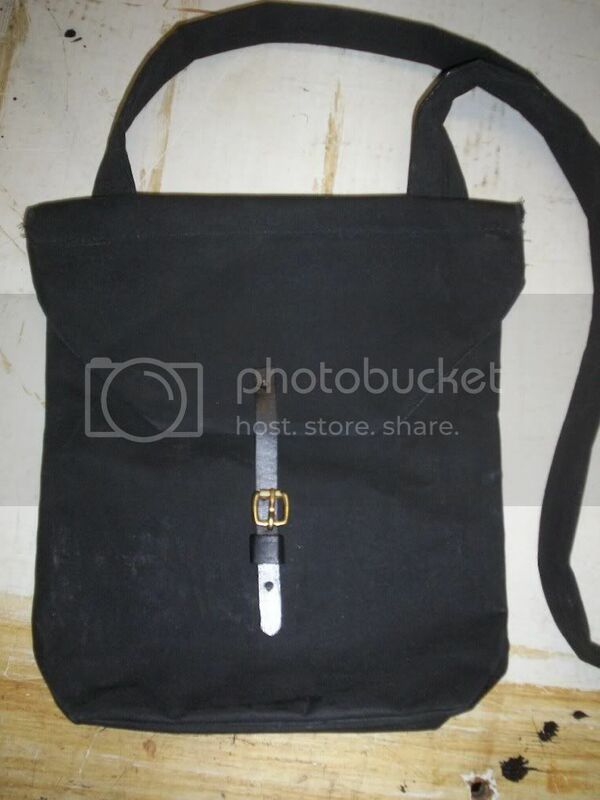 The price is $65.00 Riveted construction and can be made in Black, Brown or Natural, or Hand Sewn for $75.00. Keep watching this space for some more stuff coming soon. hey mate, good looking work. how ya doing? I'm good how are y'all doin' up in Virginny? As you can see I'm keepin' busy, not buildin' a ship .... but stayin' busy. 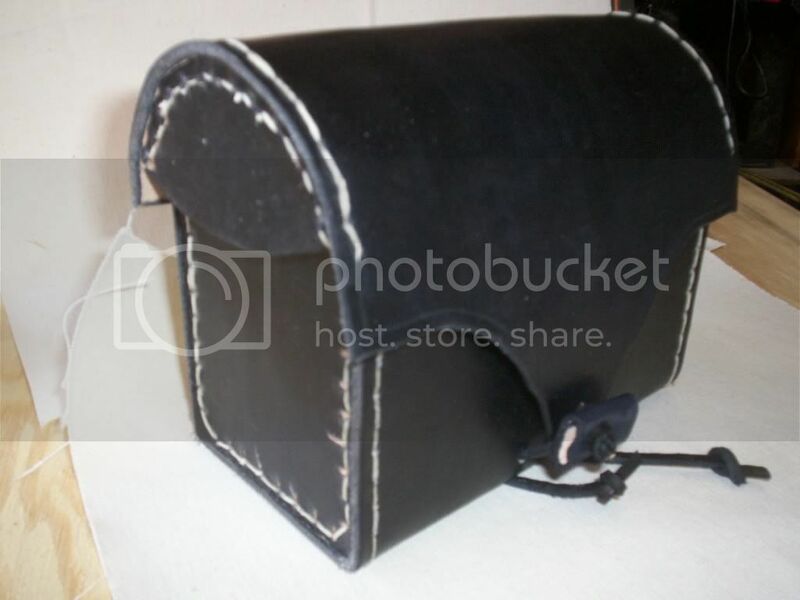 A military style leather powder storage flask good for the belt or with your cartridge box. This one is about 8-1/2" tall overall, including the spout,and 3-1/2" wide. I think it'll hold about 1/2 to 3/4 lb of powder. The large one will be 11-1/2" tall and 5" wide and should hold over a lb of powder, will post pictures when it's completed. 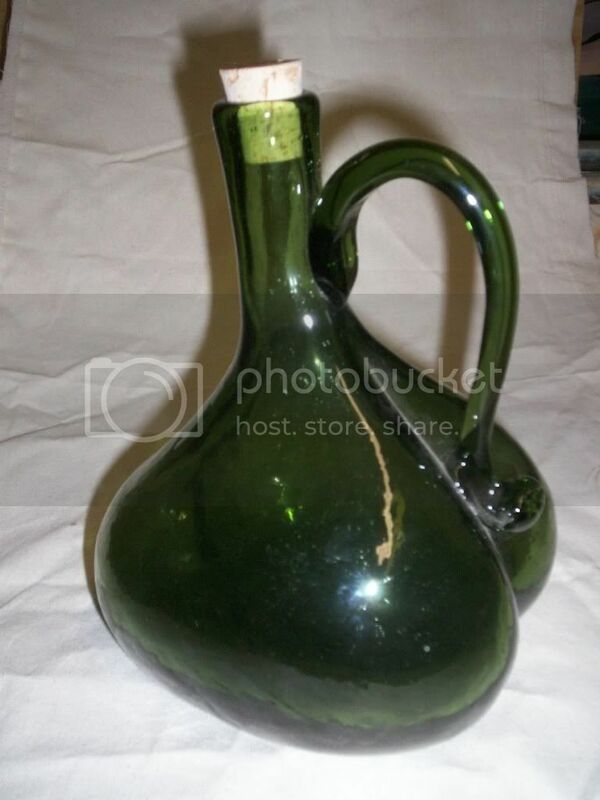 Hummmm... looks more like Mister Gibbs' medicinal flask, yo-ho. 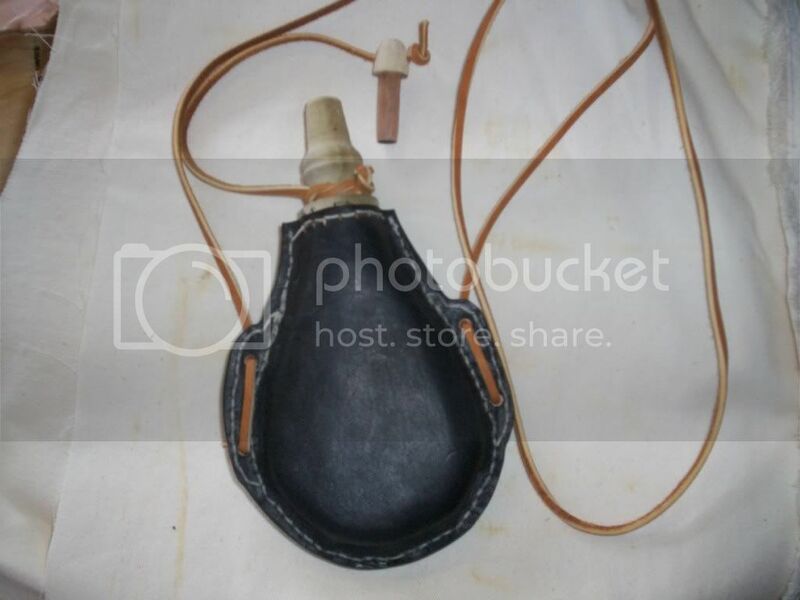 Here is picture of the larger leather powder flask. 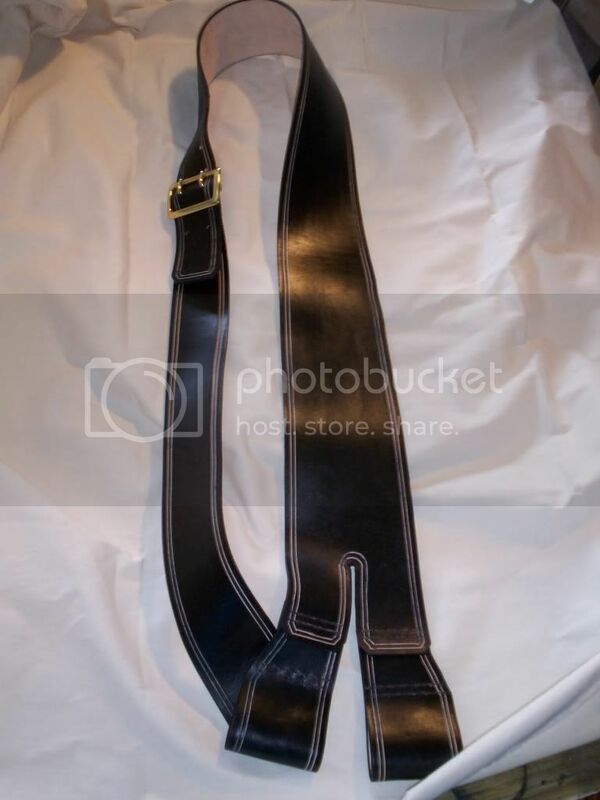 It's on a shoulder strap but can also be slung from a belt. It's about 11-1/2" tall as described in the previous post. These will be $65.00. An improved spout assembly version should be ready about the end of May. 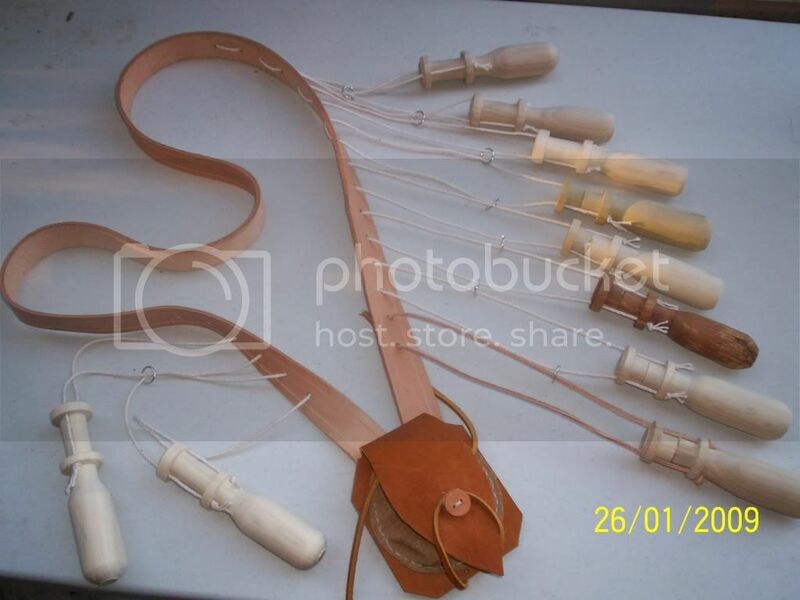 I recently ordered and received from Sutlerjon, a cartridge box, belay pin and a fid, to fill out my kit . Really nice work! Wow it's been awhile since I posted anything here been busy as can be. I came across some really nice boots yesterday. They are white "Storm Trooper" boots, they can be dyed black for our uses. These are quite servicable shoes and come from the prop dept surplus bin. I'll take $50.00 a pair and pay the shipping. I'll post photos if any interest. Your leather cartridge box came in real handy last week in Hampton. It provided splendid service as a pocket to hold wallet, room card, spare camera battery and SD card, etc.